A handful of studies have been released over the past few days about various aspects of marijuana and the medical cannabis industry, offering both good and bad news for MMJ businesses. – Teenagers in Colorado smoke less marijuana today than they did in 2009, when dispensaries began popping up around the state at a rapid clip, according to a study released this week by the Centers for Disease Control. The report found that 39.5% of Colorado high school students in 2011 had smoked marijuana at least once, down from 42.6% in 2009 and 42.4% in 2005. About 8.3% said they first tried marijuana before the age of 13 vs. 9% of high school students in 2009 and 9.9% in 2005. In fact, youth marijuana use in Colorado – one of the biggest MMJ states – is currently below the national average. What does it mean for the cannabis industry? Advocates and cannabis professionals now have a great way to refute arguments that medical marijuana laws increase teen pot use. The report is pretty convincing, particularly because it compares results in three distinct periods: before dispensaries opened, as they opened and after they had been open for two years. – A study released this week in the Proceedings of the National Academy of Sciences found that people who start using marijuana in their teens and continue doing so for an extended period of time see an IQ drop later in life. The study tracked 1,000 people born in New Zealand over several decades, finding that those who smoked marijuana in their teens and then as adults showed a dip in IQ by their late-30s. What does it mean for the cannabis industry? The federal government and some communities could use the study as further justification for the need to strengthen efforts to keep marijuana out of the hands of children – which has taken the form of bans, a crackdown on dispensaries located near school and tighter regulations on the industry. – A study published online this week in an American Cancer Society publication found that using marijuana medically or for recreational reasons increases the risk of testicular cancer. 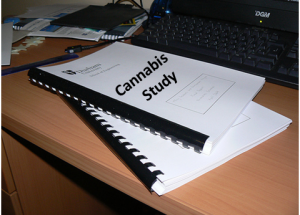 Men in the study who smoked cannabis at some point in their lives were twice as likely to have particularly serious types of the cancer compared to those who had never touched marijuana. This certainly isn’t the say-all, be-all on the issue, and many more studies are needed to prove a conclusive link between marijuana use and testicular cancer. But before you accuse the researchers of being bias, consider this: The study also found that cocaine use actually decreases the risk of getting testicular cancer. Also, a study released today claims that marijuana use may contribute to pregnancy problems. What does it mean for the cannabis industry? These reports won’t have a major impact by themselves. But, coupled with other negative health studies about marijuana, they most surely will be included in the arsenal of weapons MMJ opponents use against the industry. – The Colorado Drug Investigators Association released a study on Monday that found some recently busted marijuana cultivation operations in the state had mold levels so high that they endanger law enforcement personnel and other emergency workers.The study involved 30 grow sites that were identified – and infiltrated – by police. While some people behind the grow operations said they are caregivers and are cultivating marijuana for dispensaries or patients, none of the sites were licensed by Colorado or deemed legal under local MMJ laws. What does it mean for the cannabis industry? Not much, if anything at all. The association behind the report tried to link the results to legit medical marijuana grow operations. But given the fact that none of these operations were included in the study, that’s a big stretch and doesn’t hold much weight. The most this study can do is lead to further research that examines mold levels at actual licensed dispensaries. – A report by UCLA researchers found that there are just 472 dispensaries in Los Angeles – less than half the estimate of 1,000 frequently given by city officials. The research team found 875 dispensaries through various sources and then visited each one at the address listed to see if they are actually operating. Roughly 400 of them are not in business or never were, at least at the given location. What does it mean for the cannabis industry? This could help strengthen efforts to repeal the ban on dispensaries, which could go to a vote next spring. Dispensary opponents often used the 1,000 figure to gain support for the ban, saying it highlights how the industry has grown out of control. That played well with City Council members who feared the city would see a dispensary on every corner. But the argument is much less persuasive if the number of dispensaries is less than half the previous estimate. The testicular cancer study was inconclusive and a bad correlation. It’s just a means to blame the plant. It’s the same as blaming a drunk driving accident on the THC levels found in the blood stream. As for the IQ drop study, I bet if they were to base that study on the consumption of T-bone steak they would get the same result. Perhaps the IQ drop is closely related with aging than anything else.